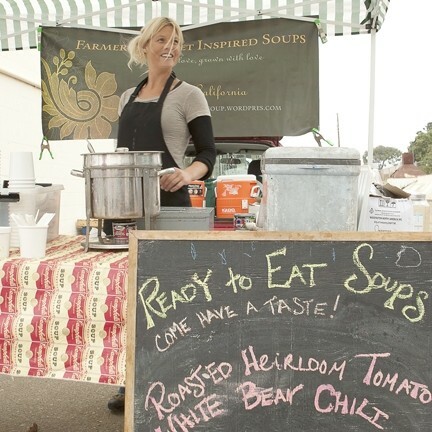 THE SOUP MAVEN : Stephanie Burchiel serves savory soup from the food court at Farmers’ Market in Morro Bay. If you’ve visited the popular Farmers Market in downtown SLO on Thursday nights—and who hasn’t?—you’ve experienced the joy of buying raw foods you can use to create delicious dishes, and/or cooked foods prepared by local restaurants. There’s everything you could possibly desire, from organic fruit, produce, honey, and dates to sustainably raised meats, seafood, and poultry. There are also many great restaurants to choose from, like Le Ciel creperie, Louisa’s barbecue, Mama’s Meatball Italian, Mee Heng Low Noodle Shop, and Oasis Mediterranean (all of whom participate in Eat Out Save Lives, check it out below). Most farmers markets around the county don’t offer much when it comes to participating local chefs. But that has changed since the Morro Bay Farmers Market introduced its new cuisine court on Nov. 4, providing locals with a smaller but no less enthusiastic version of SLO’s downtown market on Thursday nights. At the invitation of the market administrator, Peter Jankay, I visited Morro Bay on a recent Thursday afternoon to meet the cooks, fishermen, and farmers offering gourmet delicacies, all grown locally. The new Cuisine Court offers two dairies, beef and game, wild salmon, vegan dishes, fresh breads, fruit pies, and Mediterranean and Indian foods. It was bitterly cold on Nov. 18, and I regretted not wearing a warmer jacket and gloves; I was freezing. So the introduction to Stephanie Burchiel of Stephanie’s Farmers Market Inspired Soups was quite welcome. Two soup pots simmered over lit Sterno cans, offering both liquid warmth and soul food. A patron walked up and asked for a sample of the roasted heirloom tomato white bean chili, and hummed aloud at first taste. I immediately asked the friendly cook if I could have a taste, and she gladly handed one over. It wasn’t just good, it was exceptional. After that, I had to taste Stephanie’s roasted cauliflower with leeks and cashew cream. The latter ingredient, she noted, replaces dairy that’s normally added to such soups. 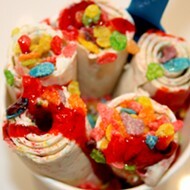 But her version is so creamy you’d never guess milk wasn’t added. It was good, but I preferred the heirloom tomato soup made from tomatoes she purchased at the farmers market, as she does for every soup. Admittedly, I’m always impressed with young people who are as passionate about life as Stephanie. Formerly the owner of the Shine Café in Morro Bay, she devoted her menu to vegetarian and vegan dishes. She explained that she’s always been sympathetic with people who suffer from food allergies because her father couldn’t eat wheat or soy, among other foods. Her parents own Birch Hill Farm where they grow kiwis and lemons organically. “My interest in organic foods came from seeing how hard the farmers work to provide good food for our bodies,” the talented young woman explained. IT WAS A COLD AND STORMY DAY : The Farmers’ Market in Morro Bay is upping the ante with a food court that provides delicious ready-to-eat wares. She encourages people to bring their own jar to take her hot soups home, but she can provide a container if you forget. “More people at Baywood bring their own jars; it’s my busiest market,” she said. 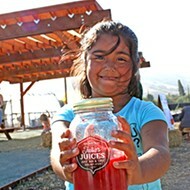 Check out her blog for details about her and the soups she’ll be serving each week at farmersmarketsoup.wordpress.com. 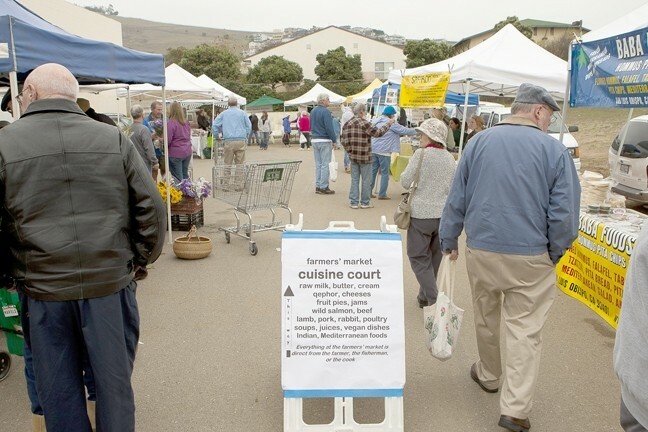 Come back to this column next week to read the full story on the Cuisine Court at the Morro Bay Farmers’ Market, which offers many impressive food stands you’ll want to know more about. If you’ve ever wanted to do something that really helps the community, then please dine at these restaurants and visit Tolosa Winery on Dec. 4. These generous, participating businesses are providing much-needed help for the terrific people at the AIDS Support Network (ASN) of San Luis Obispo County, who provide fresh food and pantry items for SLO County citizens living with HIV or AIDS. Eat Out Save Lives, an annual fundraiser honoring World Aids Day, helps ASN stock its food pantry for 2011. Because of the current economy, they’re working much harder to help people in need. If you dine at these participating restaurants for breakfast, lunch, or dinner, the restaurants will donate 10 percent of the day’s sales to ASN. You can make a difference simply by stopping in for a cup of coffee or to enjoy a full meal. Please note: the Neon Carrot (closed weekends) is participating during lunch service on Friday, Dec. 3, and Upper Crust Trattoria is donating a portion of proceeds only from orders of the manager’s special on Saturday. To catch any last-minute restaurant additions, visit asn.org, and consider other ways of helping them out year round. San Luis Obispo: Big Sky, Black Sheep, Buffalo Grill, Café Roma, Chino’s Rock and Tacos, Crushed Grape, Et Voila!, Greenhouse Grill, Jaffa Cafe, Koberl at Blue, Le Ciel Crepe Café, Linnaea’s Cafe, Louisa’s Place, Luna Red, Mama’s Meatball, Mee Heng Low, Neon Carrot, Novo, Oasis, Smiling Dog Café, Spirit of San Luis, Splash Café, Taj Palace, Tolosa Winery, Upper Crust Trattoria, and West End Espresso & Tea.